NASA announced its 2017 Astronaut Candidate Class on June 7, 2017. 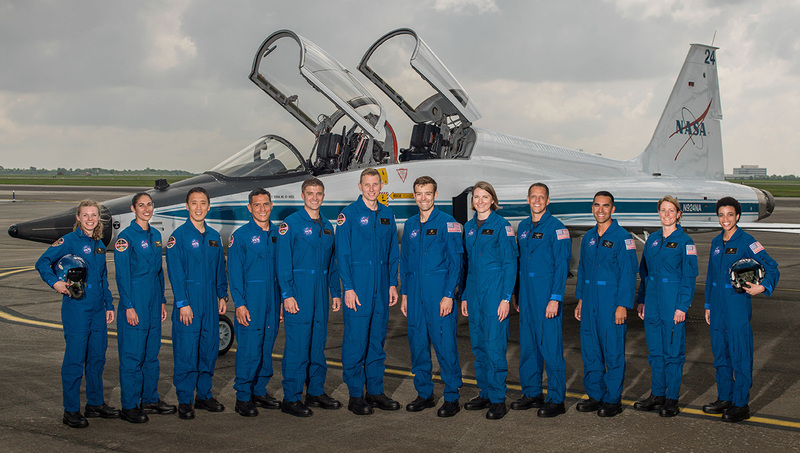 The 12 candidates, pictured here at NASA’s Ellington Field in Houston, are Zena Cardman, U.S. Marine Corps Maj. Jasmin Moghbeli, U.S. Navy Lt. Jonny Kim, U.S. Army Maj. Francisco “Frank” Rubio, U.S. Navy Lt. Cmdr. Matthew Dominick, Warren “Woody” Hoburg, Robb Kulin, U.S. Navy Lt. Kayla Barron, Bob Hines, U.S. Air Force Lt. Col. Raja Chari, Loral O’Hara and Jessica Watkins. Vice President Mike Pence joined NASA leaders Wednesday as they introduced the members of the 2017 astronaut class during an event at the agency’s Johnson Space Center in Houston. While at Johnson, the vice president toured the International Space Station mission control center, and the historic mission control center, which was used during early NASA spaceflights, including the first moon landing mission, Apollo 11. He also was presented with a model of the International Space Station anda framed U.S. flag that was flown to and from the orbiting laboratory this winter.